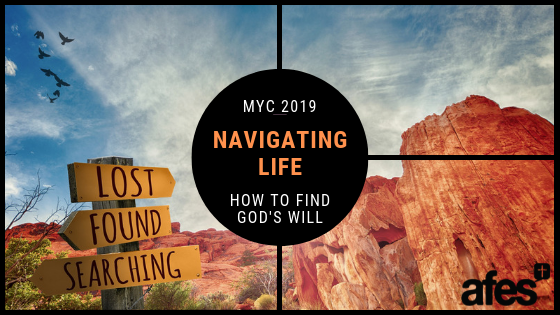 MYC 2019 is happening July 22-26 in Perth, WA. Register below to reserve your place and join the MYC Facebook event to stay up to date. Download a brochure. We instinctively believe that God will help us navigate life, but our desire for clear guidance doesn’t always match up with our experience. That’s why this year at MYC we’ll be exploring how God helps us navigate life, so you can live life with confidence. Visitors’ night is on Tuesday July 23, from 7pm at Camp Wattle Grove. July 13 - Registrations have closed. To be put on the waiting list, enter your details below. Registration is then subject to confirmation from the registrar. If you have any questions, please contact your MYC rep, campus staffworker, or include them in the comment box below. MYC information will be sent by email from myc@afeswa.info. If you don't receive an email, please check your spam/promotions folder. I promise I will check my spam/junk folder. I also promise I will check my promotions folder. Once you submit this form, you'll need to arrange to pay for MYC by bank transfer or deposit (cash) to the Christian Student Support account. Instructions, including account details and a reference number, will be emailed to you (please check your spam/promotions folder if you don't receive it). Once you submit this form, you'll need to arrange to pay for MYC by cheque made out to "Christian Student Support". You'll also need to arrange to deposit the cheque yourself at an NAB branch. Further instructions will be provided by email (please check your spam/promotions folder if you don't receive it).